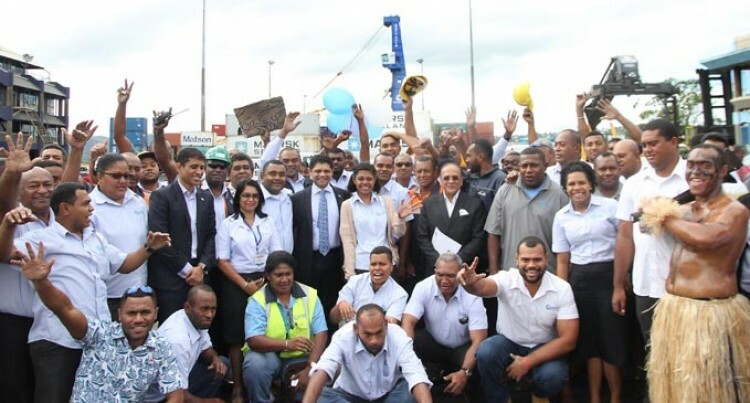 Happy Fiji Ports Terminal Ltd. workers with Minister for Economy and Attorney General Aiyaz Sayed-Khaiyum, Ministry o Trade Permanent Secretary, Shaheen Ali and Board Chairman, Hasmukh Patel following the announcement of their bonus pay-out by the Minister in Suva on July 26, 2017. Photo: Ronald Kumar. Vinay Anand could not stop smiling. He was one of 348 Fiji Ports Terminal Limited employees who received their bonus payout yesterday. The incentive he said would assist in his home renovations. “The bonus surely helps in purchasing school items for my year nine and year four children, I am thankful to Fiji Ports for looking after us, the staff,” he said. Mr Anand has been with the company for 13 years. Fiji Ports Terminal Limited Chairman Hasmukh Patel confirmed that the payout is in consideration of the financial achievement in 2016. He said it was decided in the last board meeting to allocate a sum of $383, 326 to distribute amongst 348 employees as performance incentive payout. Minister for Economy and Attorney-General Aiyaz Sayed-Khaiyum while officiating at the event said Government has a long term strategy and a goal to ensure Fiji economically becomes a power house in the South Pacific. He emphasised the need to divert resources in what is called hard infrastructure, soft infrastructure and human resources development. He said there is a need to ensure Fiji’s port system is strong as well as the airport system. “We also need to ensure that all Government entities, ministries and institutions look after staff well. If you are able to ensure that you have the right staff for the right job and invest in them, then the level of productivity will increase”.